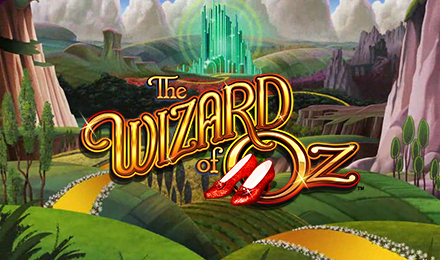 The Wizard Of Oz™ Road to Emerald City™ slots is a 3 reels and 9 paylines game developed by WMS. The slot game comes with seven triggerable bonus rounds where you can win cash prizes, free spins, multipliers and more! This innovative slot game is themed on one of the world’s most popular books written by L. Frank Baum. The musical film setting is built into this slot game, along with symbols that correspond to the theme. Find symbols like: Emerald City, Red 7’s, Wizard of Oz Logo, Bar, 2x Multiplier, Double Bars and Triple Bars. Wizard of Oz logo is the most rewarding symbol and links to a 5,000-coin payout. The fantastic look of the game is best played in portrait. This game be done at Moon Games when you play via mobile, desktop or tablet! Before your start playing, set your bets and watch your journey in Emerald City unfold. Bet Levels: There are no bet levels in this game. Coin Values: Select coin values as from the lowest amount of £0.35 to the highest amount of £70.00. A different bonus round is awarded with an extra cash prize or multiplier. Receive anything between 5 and 20 free spins. Trigger the feature with four emeralds and it will be collected with every emerald that appears in the free spins round. Collecting three will play another bonus feature. One free spin is awarded with reel one containing wild multipliers of 25x, 15x, 10x, 7x, 5x, 3x, 2x, or 1x. Then, Emeralds transform into wilds for the free spin. One to three crows can land on a Scarecrow, with the first crow giving you a cash bonus. The second crow gives you either a cash bonus or multiplier. And the third crow awards a multiplier, which is then applied to the sum of your cash bonuses. The wild symbol takes over reel 2, and spins start with a multiplier of 1x. Every Emerald landed increases the multiplier to 2x, 3x, 5x, 10x, or 25x. The feature is also guaranteed to end with a win spin. The witch takes over reels one with three free spins awarded. If a wild logo or emerald symbol lands on the reels, this will turn into a sticky wild for the rest of the free spins. This feature allows you to benefit from unlimited free spins with emerald symbols moving on the screen to fill a corresponding trail. Emeralds on reel one move to the left trail, emeralds on reel two move to the middle of the reels and emeralds on reel three move to the right of the trail. Reach the end of the trail and bag up a massive cash prize.